So you think you know the Prime Directive? The preamble to the Federation Constitution states the purposes for which the Federation of Planets was founded. These include saving succeeding generations from the scourge of intra galactic war, to reaffirm faith in the fundamental intelligent life-form rights, to promote justice, law and mutual respect, and to promote social progress and better standards of life. In short, the Federation exists to promote and extend societies based upon law, rights, peace, justice and related virtues, while limiting societies based on violence and war. The Federation has a social agenda. It is a force for improving society. The modern wording of the Prime Directive - that Starfleet is prohibited from interfering with the normal development of any society - is thus in inherent conflict with the basic reasons the Federation was created. I Robot meets Dorsai - The philosophies of to classic SF authors, imported into a Star Trek environment, clash. Basic Weaponry - How would you choose to confront cute little baby horta? Save the World - Or is saving the attacking Giant Space Amoebae more important? Welcome to the Joy Class Android home page. 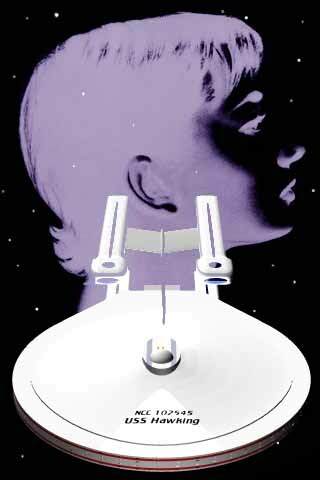 The Joys are role playing characters active in America On Line's Star Trek 'Simulation' community. Joys Five, Seven, Ten, and Eleven are currently active on Spacefleet On Line's USS Republic, Continuum Online's Federation Council, Celestial Prime Alliance's USS Defiant , and Spacefleet On Line's USS Hawking. It is said that taking from one source is plagiarism, while taking from many is research. The Joys are well researched. 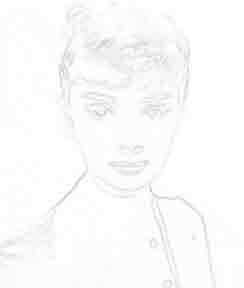 The Joys are inspired - among other things - by the "I Mudd" episode of the original Star Trek Series, Data's emotion chip, Asimov's Laws of Robotics, and Holly Golightly from Audrey Hepburn's movie Breakfast at Tiffany's. In addition to the multi faceted Joy, there are also glimpses of artificial versions of James Kirk, Bruce Lee, and Fred Astaire. These pages are still growing. Each week Joy has a few more adventures, and I write a few more stories. The best of these will be added to the log pages. The log pages run from oldest on the top, to newest on the bottom. Occasional visits to see what new tales are to be told may be worth your time. False priority. From echoes of old programming comes an erased command. Personify the Art of oo-mox. Traces of an old conflict. Priority one, kill the man. Priority four, seduce him. Show him some leg, then kick with it. If the tongue isn't committed to an attack, lick lips suggestively. Crane stance to show your profile, providing distractions from the knife. Smile always. Attack in time to the music. Mix moves, dance floor and dojo. Be the music. The music is life. The music is death. Mudd's policy has been to emphasize legal, negotiated, and nonviolent solutions to problems. However, we admit some problems and situations cannot be solved with polite words. The Founder's recent attack on the Federation Council might very easily be one such situation. I am aware of the Council's mood for a violent response to this attack. Some action to deter repetition of the event might be appropriate. However, escalation of violence has never been the Federation's path. The Founders sent a raid of a few individuals which has resulted so far in zero deaths, two illnesses, and one prisoner taken by each side. The dominant proposed response is a "joint operation targeted at reducing Dominion offensive capabilities" or alternately a "threat-reduction action". Behind these bland words sculpted to be devoid of menace, what we have proposed on the Council's agenda is mass murder and extensive destruction. We propose to cross into another power's territory, cry havoc, and let slip the dogs of war. I entered Sickbay, a single rose in hand. It was a white rose, not a red. According to LCARS, this made it a symbol of purity, not of passion. The doctor seemed unaware of this. He looked at the rose, then me, and his eyes seemed to accuse me of deliberately violating my Fifth Priority. I was not. Not technically. I was visiting an ill person. Organic tradition encourages giving flowers to ill people. At Priority Two, Asimov's First Law requires me to do as I can to improve the health of organic beings. The flower was white, not red. Males give females flowers as indication of sexual interest, not the other way around. The Priority Two Law regarding health overrides the Priority Five Law on sexual activity. None the less, I monitored my facial color diodes shifting to red, and my emotion chip would not allow me to meet the doctor's eyes. I hid the flower behind my body, and went searching for Nu. Dragon Friend So you think you know how to play a dragon? If Joy was the yin, and the Klingons were the yang, Bruce was the Tao. He mixed flowing defense with powerful strikes, speed and strength, grace and power, all in balance. In many ways he was Earth's Champion. He was among the first to teach the other races of the planet the secrets of oriental combat. He was among the first to film martial combat sequence for entertainment, changing Earth's entertainment industry forever. He was also taught by some of the last true masters, who in their youth had fought for their lives with muscle powered weapons. Not long after, Earth's warrior heritage was lost to guns, padded boxing gloves, and a quest for trophies. Unlike Kahless, Bruce was just an image, not a real warrior. His glory was written in celluloid, not blood. His chief victim was the buck toothed, nearly blind oriental stereotype. Mickey Rooney's yellow man was replaced in the western eye by a gentle warrior who quotes philosophy, walking in peace if possible, but a dragon if need be. If this dragon never had a starship named after him, his spirit dominates the stars near Earth none the less. Web Counter has you as visitor since July 7, 1996.